My excursion to Viñales was one for the books. Viñales was declared a UNESCO World Heritage site and is almost completely undisturbed beyond the city limits. Knowing there were so many activities we wanted to accomplish, we booked a private tour with Discover Viñales Tour Company. We were picked up by our driver early in the morning in Havana and departed for our two hour drive. Once in Viñales, we picked up our guide, Yaniel and headed toward the Indian Caves. We walked through the caves to the boat that guided us through the remaining cave. After the caves, we headed toward a tobacco field, sorting house and paid a visit to Rene, an expert tobacco farmers who’s been rolling organic cigars for over 50 years! After the tobacco field tour, we had lunch at an organic farm overlooking the most picturesque valley. The meal was the freshest meal I’ve ever had, as we walked up the to the restaurant, we saw farmers pulling fresh vegetables from the ground. Talk about farm to table. 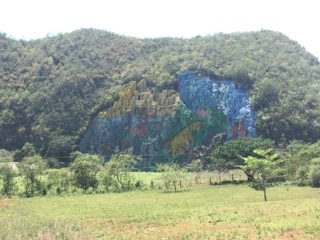 After lunch we visited the prehistoric mural and rode horses through the Silent Valley. I can’t recommend visiting Viñales enough and booking a tour with Yaniel through Discover Vinales. This city is the most undisturbed, beautiful area I’ve ever seen.